Listen by clicking 'Play' above, download this podcast HERE, or read a transcript, below. Aidan Lang is beginning his first full season as solo General Director of Seattle Opera—and he’s out of the gate with an exciting experiment, a bold new production of an opera Seattle has never before heard: Verdi’s early monumental epic Nabucco. The production, currently in rehearsal, will be something of a cross between a Shakespeare play and a rock concert, aimed at presenting this overwhelmingly powerful Bible story to its best advantage. 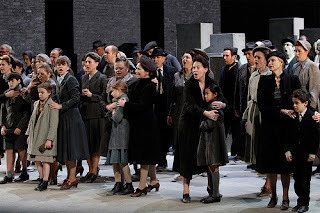 Lang told us a bit about the opera and the rationale behind the production, which he hopes will create the sizzling connection between stage and audience so vital in Verdi’s theater. Nabucco is new to Seattle Opera. What’s it about? It’s a Biblical story, a setting of the story of Nebuchadnezzar. 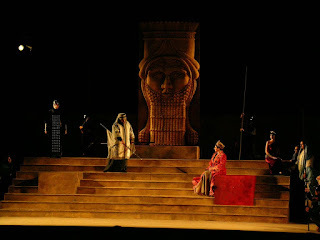 The opera tells of an invading king of Babylon, Nebuchadnezzar, who sacks Jerusalem and then has a conversion to the Hebrew faith, and the opera ends with a positive outcome. Unusually for a Verdi opera, Nabucco has a happy ending (from a Judeo-Christian perspective). What’s the moral of the story here? Nabucco is saved from his madness by a realization of the price he’s paying—that his daughter will be executed along with the Hebrew people. He returns from his madness and converts to the Hebrew God. Is that the point of the opera? I think it’s really about hubris. The key moment is at the end of the second act, when he declares: “I am not king, I am God!” and then gets struck by a thunderbolt for his pains. The point is that man has his place. If he overrides that, there’s a price to pay: the life of his beloved daughter. But more interestingly Nabucco introduces themes which prevail throughout Verdi’s work, particularly the relationships between fathers and daughters. He always writes father-daughter relationships, and he didn’t have a daughter himself. And there’s huge tenderness, the fathers to their daughters. I have a daughter myself, so I guess I relate to that! Rigoletto is the best example. If you compare, say, the relationship of Rigoletto to Gilda to that of Germont and Alfredo in Traviata, it’s clear that Germont is thinking about his daughter, not about his son. There’s something really strange going on here, and I think it may be that the intensity of the feeling is precisely because it’s a feeling Verdi didn’t have himself and wanted. Tell us about Nabucco and his two daughters. In the case of Fenena, what’s quite interesting is that she’s an independent spirit. She converts to the Hebrew faith ahead of Nabucco’s conversion at the end. So she goes her own way; she allows her feelings to lead her, even if it means effectively being led to her death, dying for her faith, which is part of the spur for Nabucco’s conversion himself. The other side is Abigaille, and here we see a direct parallel with King Lear: lust for the throne and children who defy their father, much like Goneril, Regan, and Edmund in King Lear. And Nabucco’s madness, which is the result, is obviously a match for Lear as well. Let’s talk about Nabucco and Italian politics. Verdi was intensely interested in politics and an apostle for the cause of Italian unification, which wasn’t going to occur until the early 1870s, so thirty years after this piece. “Va, pensiero” became a sort of unofficial national anthem for the Risorgimento, the move for Italian independence away from the rule of the Austrian empire. And after this opera Verdi’s name itself became an acronym for the cause; V-E-R-D-I meant “Victor Emmanuel, Re d’Italia,” Victor Emmanuel, King of Italy. So this piece has always been inextricably linked with the Risorgimento. And it’s often asked, was this piece meant as a spur, as an encouragement for that cause? Did Verdi intend it? I’m not sure he did. I think actually it was a happy chance that echoes were found with the suffering Hebrew people, that Verdi’s audiences found a direct parallel to their situation. Verdi became a slightly unwitting apostle for the Risorgimento. But that’s not to say Verdi didn’t have very strong political convictions. He certainly understood politics as a dramatic force, as the basis for a lot of his work. 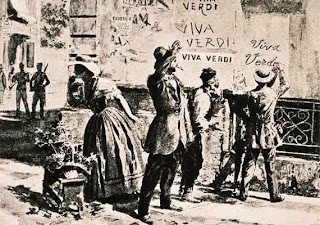 The idea of an invading army, the sacking of a city, the movement of great political forces, was an attraction within the subject matter for Verdi, undoubtedly. What does Nabucco tell us about violence and power politics in the mideast, then and now? Has anything changed in the Middle East between the Biblical times and now? It’s part of the world which has always been in conflict. It’s desert...boundaries shift with the sands. Conflict has certainly been part of that region for many many many generations. Again, was that Verdi’s intention? No. There have been many contemporary productions which draw parallels between the story and current events in the mideast. Personally I’ve always found that’s interesting for about ten minutes, and then you get into big problems. You know, people who brandish Kalashnikovs move in a realistic time frame, and yet the weight and grandeur of this music plays against a scenic plan which requires very detailed, naturalistic acting. For me, that has always been a big problem with contemporary productions of this piece—the visual image is at odds with the musical pulse. What’s the connection between this opera and Shakespeare? Verdi is sometimes called “Opera’s Shakespeare.” He wrote three operas based on Shakespeare: Macbeth, Otello, and Falstaff, which is a setting of The Merry Wives of Windsor. The opera he always intended to write and never got around to was King Lear; in many ways this work is the nearest he gets to King Lear. What appealed to Verdi in Shakespeare? The directness of the dramas, the pace, and also the variety. What defines Shakespearean theater from European theater is the mixed genre. With Shakespeare, even in tragedy there is black comedy, lighter moments. Whereas a French tragedy is absolutely unrelieved seriousness. Verdi may have been a bit envious of the English having Shakespeare as their national playwright and wanted to claim a bit of that feeling for himself. Maybe the fact that Verdi was of humble birth helped him identify with a writer who was not an aristocrat, who wrote popular theater, for the people, because Italian opera was popular theater and Shakespeare was certainly writing for a popular audience. And it wasn’t just Verdi. Shakespeare underwent a huge revival in the nineteenth century. There was an element of Shakespeare that appealed to the Romantic movement; they were eager to adopt him. And I think it was the freedom, the free will of the characters, that appealed to the nineteenth century—certainly to the Romantic ideal. Where does Nabucco fit, among all the Verdi operas we know and love? Nabucco is Verdi’s third opera, and as we might expect from a composer who’s finding his way still, stylistically the piece still belongs to the opera-writing of the late 1830s, 1840s. It’s written in quite a monumental style—it has big address, big arias, big ensembles, which might hold the action up by comparison with the style which Verdi evolved later in his life. But that’s not to deny in any way its magnificence. It is opera written for singers. Some of these roles are extremely challenging. Abigaille is probably the best example of an almost unsingable role. And Nabucco himself has huge vocal challenges. It’s written with a nod to the bel canto tradition, where the skill of the performer, the technical complexity of the writing, is part of the excitement of the entertainment, or the thrill of big chorus writing; that’s why the audience has come. That’s not to say that the later Verdi writing doesn’t require huge vocal ability. But Verdi moved towards what we call the ‘through-composed’ style, which we see in Puccini, beginning with Rigoletto and Traviata, which are eight, nine, ten years later than Nabucco. So don’t expect the fluidity of Rigoletto, because he hadn’t got there yet. But do expect writing of huge vocal impact and monumental emotional charge. In many ways Nabucco is not dissimilar in its feel to Aida, which likewise has big grand scenes, quite apart from being set in that part of the world. Although written much later, Aida has a similar feel. But part of the fun of Aida is the orientalism of the setting, which doesn’t play such an important part in Nabucco. Yes, Nabucco is set in Biblical times, but it doesn’t seem to be about that so much. Whereas Aida, written for Cairo, it’s about Egypt. I don’t think this piece is about Babylon and Jerusalem: it’s actually about the way man relates to his God and his faith. What are the pitfalls in terms of staging Nabucco? If you’ll excuse a wee bit of theater history, one of the things which fascinates me is the way the theatrical conditions of any work have a huge impact on its style. Now we mentioned Shakespeare earlier. Look at the later Shakespeare plays, when we know he went to an indoor theater away from the Globe. The style becomes much more intimate (or, to put it another way, much less bombastic and grandiloquent). Shakespeare understood that if he was writing for an open-air stage in London, his writing needed to carry that environment. If you go indoors, you don’t. Now, the theater in Verdi’s time, in the 1840s, was very different to what we have today. The relationship between the audience and the stage was completely different by dint of the fact that there was not yet the technology to create an illuminated stage and therefore a darkened auditorium. The theater would have been illuminated with candlelight, and they would have made attempts to heighten the stage picture with footlights, with candles with a metal or glass reflector behind it. The singers would have been right down at the front. Scenery was two-dimensional perspective painting, and there wasn’t a whole lot of space. Therefore, the audience was witness to a very different form of theater. There would have been much greater contact between the stage and audience than you get in a darkened auditorium, because in the dark, the singers are in what we call ‘inner thought’ rather than outer declamation. So we’ve built a stage, not dissimilar to a Shakespearean thrust stage, extending up to the first row of the audience. We had to put the orchestra somewhere else, so we’ve relocated them behind the acting space. You’ll see them, dimly, but the idea is that you ignore their presence the way you would ignore an orchestra in the pit, and focus your attention firmly on the performers. We’re hoping we can find an acting style which is much more direct and much less rhetorical, one that respects the weight and grandeur of the music. And at the same give the audience even more of a thrill at the exciting singing by this close proximity than if they were thirty feet farther away, the width of an orchestra pit. So we’re trying to get that Shakespearean feel which is in the piece, and to capture in a modern way the intimacy that Verdi’s audience would have felt with the performers and vice versa, better than we would be able to do if we just were in a conventional proscenium arch setup. So it’s an experiment, to try and get that thrill of the piece, to help it make as strong an impact, and therefore case for the piece, as we can. We invited François Racine to direct; he has done a number of productions in this manner, playing around with space and the relationship of audience and performer. François came to Seattle and we brought in Duane Schuler, the lighting designer, and Bob Bonniol, the video designer, for a big think-tank. Gradually, collectively, we evolved our scenic plan. I can’t remember whose idea it was to bring the stage over the orchestra pit; we thought, why end at the front of the stage if we can come even further? It was one of those examples where many minds make a much more creative solution than simply one. And we were able to discuss practicalities of lighting and projection surfaces. Tell us a little about the use of projected imagery in this production. If we didn’t want to have heavy, stolid Biblical scenery, we nevertheless have to suggest location. This opera requires us to see the Hanging Gardens of Babylon, the Temple of Jerusalem and its destruction... these Wonders of the Ancient World, which we don’t really know what they looked like! So we invited Bob Bonniol and his team to evolve a series of projected images, some of which are animated, some of which will stay still, which enable us to move very clearly from scene to scene. When necessary they comment or add intensity, or be it a sense of location or a reflection of abstract feeling and emotion. And on this vast projection screen we can get a sense of awe, of scale, apt to the epic nature of this piece. And what really pleases me is that the team understood: projected imagery must never get in the way or become a means to its own end. We need something which is arresting, and creates a sense of presence and mood, but that never deflects attention from the acting. And I think the extraordinary images they’ve evolved meet that brief really very well. I’ve seen many productions with video projections where, after five or ten minutes, you go, “Oh, for God’s sakes! Stop! Stop a moment.” It’s very easy for it to upstage the acting. François Racine has been with Seattle Opera before; in fact he won the Artist of the Year Award for his staging of Bluebeard’s Castle and Erwartung back in 2009. He was delighted to come back. And he brought with him one of his colleagues from Montréal, Ginette Grenier, our costume designer, who’s come up with a marvelous array of costumes which respect the Biblical side to the story AND at the same time make very clear who are the Hebrews, who are the Babylonians. She has chosen fabrics which allow movement, rather than stiff, heavy fabrics which restrict the performers’ movements, so the costumes will enable a modern, dynamic style of acting, while paying absolute respect to the Biblical antecedants of the work. What are the vocal challenges of Nabucco? 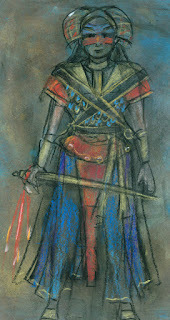 Nabucco really is a singer’s opera, and it’s essential to cast singers who can ride its intense vocal demands. Our two Nabuccos are both artists returning to Seattle Opera, and Gordon Hawkins and Weston Hurt are intensely experienced in this genre and are right on top of the character. Abigaille is an extraordinary role. Mary Elizabeth Williams has sung it before, to huge acclaim, and we had her as Tosca quite recently and we’re thrilled to have her back. And the alternate cast has a wonderful Italian singer, Raffaella Angeletti, who also has done this role before. She’ll be making her Seattle Opera debut, as will both our Zaccarias, American singer Christian Van Horn and Andreas Bauer, who has come to us from Germany. So in those three exceedingly difficult roles we have some really top singers. We’re also thrilled to welcome back Russell Thomas, as Ismaele, and making her Seattle Opera debut as Fenena, Jamie Barton, who just won the Richard Tucker prize in New York, making her debut. So we’re really over the moon about the quality of the cast. And what about our conductor? Maestro Carlo Montanaro has conducted this piece many times. In the early rehearsals the singers have already been delighted by his attention to detail. He’s not allowing a sort of lazy, rhetorical singing; he was immediately finding fine details in the music, and all the singers responded to that. They realize that it’s necessary; what’s happening musically must echo the intensity and intimacy of the acting style made possible (indeed, demanded) by our scenic plan. We don’t want loud, meaningless, abstract singing. So it’s a very happy coming-together of Carlo’s approach to this piece and what we’ve evolved scenically.